It's safe to say that I am finished with the genre of middle school, silly, growing up, boy-oriented books. There's nothing wrong with the plethora of offerings from James Patterson and the rest of the gang, I have just read too many of them. My students love them and don't need me to recommend them, so I can turn my attention to less beloved genres. 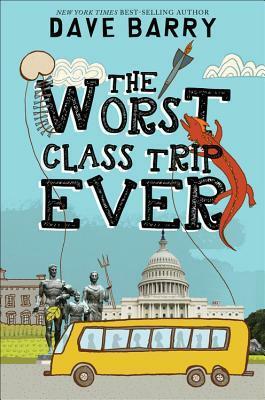 As an addition into this set of literature, The Worst Class Trip Ever, is welcome. Clearly, Dave Barry can write humorous books and I know that my kids will enjoy it. The story follows Wyatt on his eighth grade trip to Washington DC and the hijinks that ensure when he may or may not have prevented a terrorist plot. I read 100 pages and then said, "I'm done." Kids love these books and I am happy. I just don't need to read any more of them!